Years ago, Safecastle emerged online doing special Mountain House group buys--especially 3-case variety packs. The popularity of those 18-can / 18-variety kits has never waned. This year's special buy, for which we purchased the most popular Mountain House freeze-dried varieties and sorted them into 3-case kits, is now underway. This year, we are expanding the sale and calling it the "Before the Fall" sale. Suffice it to say, we believe it is critical right now that we are all as prepared as we can be. 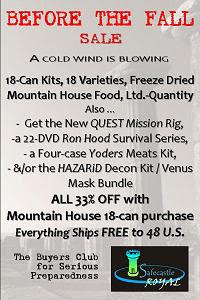 Just for this sale, we have added some new products and selected some other very important popular items and posted them at 33% discounts for anyone and everyone who purchases at least one 3-case Mountain House kit. You do not need to be a buyers club member to take advantage of this. And remember--everything always ships free to the lower 48! Check it out ... act decisively ... be ready. The brand new Safecastle QUEST Mission Rig, available in hard case or soft case, contains an array of must-have resources if you are to feel ready to deal with either day-to-day challenges or major crises that may befall you. Examples: first-aid gear to include a pouch of CELOX hemostatic agent, a K8 Nuke Safeguard Mini Alarm, a Streamlight Scorpion xenon-bulb lithium-battery flashlight, and much more. A unique and complete, award-winning collection of survival DVDs by expert Ron Hood, including his Woodsmaster and Urban Master series. A four-case Yoders wet-pack meats assortment of your choosing out of these available options: Beef, Ground Beef, Chicken, Pork, Pork Sausage, Turkey and an assorted variety case. The hospital-grade HAZARiD decontamination kit / Venus Gas Mask bundle. The HAZARiD is just about the best tool available to protect your household or business from infectious dangers such as mold, staph bacteria, flu viruses, and mildew. The Venus Gas Mask is an excellent, reliable, NBC-grade mask with a very comfortable fit. Quantities are limited. Act quickly. If we assume that some grand combination of circumstances will soon inflict a macro-chaotic dynamic upon our reality, then it follows we are now in the mode of doing our utmost to complete our preparations for potential societal upheaval. This is not to say that we are packing up all our belongings and heading for the hills, calling up the boss (or not) and quitting our jobs, or even bolting down the hatch from inside the backyard bunker. Life will go on ... before the worst happens, if it does ... as well as during the worst and afterwards too. The whole objective of preparedness is to be able to deal with it, no matter what the future holds. That means, don't run before the balloon goes up. Likewise, it would almost always be a bad idea to razor-wire the perimeter and fire potshots at trespassers (at least until the need becomes more than obvious). Get thee arms and ammunition. Take training and get familiar with your weapons. If you have kids, keep the weapons safely out of reach from those curious, busy hands. My personal favorite for safe but quick-access handgun storage is the Gun Vault. My guess is most folks are squared away with guns and ammo by now. Although some of my peers say the weapons are priority number one in prepping for major crisis, I believe having adequate stocks of storable, useable food (not to mention seeds) is more important. In this same area, we need to assure we have the ability to independently access and purify water. If you can hole up and provide yourself with food and water for an extended period of time, you create the smallest target and minimize your vulnerability. Of course, you do want to be able to secure and defend your area of operations. Just as important, if not most important of all (and yet probably the task most ignored by those who prepare) is the need to bond with others in your community. 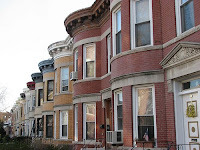 You should be talking with neighbors and others you trust who live fairly close about contingencies and how you can each contribute to a cooperative survival effort should local emergency services and commercial enterprises fail to any degree. Senseless and desperate acts of violence WILL be a reaction to worst-case systemic failure in our modern, entitled society. Few if any can really expect to be able to endure alone a violent upheaval in our communities. On the other hand, those who cooperate to support and defend each other, who trust each other, who share resources and capabilities--they are the ones who will do OK. In my business, I do have the opportunity to interact with small groups who are coming to these same conclusions. These are not militant survivalists with compounds in the wilderness. These are neighborhood, family, and church-based groups all over the USA. They are making common-sense preparations for food shortages, energy crises, and now economic collapse. It's the absolute smartest thing any of us can be doing today--building good relationships with those around us so that if and when push comes to shove, we actually know who we can turn to for help. In this blog I typically try to blunt the thorniest alarmism, attempt to moderate the crescendos of the most craven pessimists, and strive to sooth those giving in to panic in the face of the media's disaster-of-the-week scenarios. Admittedly today, temperance in conduct and expression is really but a quaint effort at historical re-enactment. Still, the bottom line for me day in and day out is that preparedness is about peace of mind. Yep, bad things happen every day to someone out there. I aim to help folks who want to be ready for their turn on the rack. However, of late, I have been sparring with and sometimes retreating from visions of the future that seem to be as dangerous as one can come to grips with in advance of a fearful new dawn. With each passing day and the advent of weightier repercussions of past governmental misdeeds, not to mention a subnormal executive and legislative approach to crisis management, I see fewer and fewer possible escape routes for America's good citizens. Disaster resulting in immense pain and suffering at the hands of vile evil seems to be bearing down on us from any number of directions. Am I predicting calamity? I don't know. It really doesn't matter what I think is going to happen. I can say this much with certainty ... there are so many malignancies, villains, and stooges on the stage, chaos may be the best we can hope for. 1. Opportunistic crime - I believe we are seeing increases already in the number of individuals "snapping," failing to endure increasing economic hardships and the stresses that brings on. The result is more folks committing violent crimes of passion and desperation. Of course, we also have our core group of 20% of the population who have no morals to begin with and who are always on the prowl. But now we've got an enlarging subset of "victims" eventually frantic to turn the tables, lashing out at innocent bystanders--sometimes with tragic effect. 2. Organized crime - Gangs are and have been a growth industry in America for many years. Illegal immigration has played a part in bringing the worst from various cultures to our land of opportunity. Law enforcement efforts in this area are too little and getting less daily, due to shrinking budgetary boundaries and ever more charitable legal protections for the guilty. Moreover, as legitimate avenues to personal growth and/or survival dry up for young people, gang affiliation becomes the only real option. In the business of blood and intimidation, fear feeds the beast. This monster is only beginning to emerge given the conditions of the new dysfunctional economy. 3. Ethnic and political polarities - Who do you trust in times of real crisis? Family probably. Longtime neighbors and friends. Members of your congregation ... maybe. In a real pinch, others who look and talk like you. But when bullets fly, those who aren't wearing your brand of camo or speaking your lingo are not likely to easily gain your trust. In times of trouble, politics and ethnicity are quick differentiators. It's possible that terror operatives (or other scoundrels) today could work this angle, especially taking advantage of economic depression. If political upheaval or ethnic unrest erupts, and if frustrations are already widespread and emotions are high, well ... things can and will quickly get out of control. 4. Governmental intrusions and heavy-handedness - This is already a bone of contention and a rallying cry for a growing number of Americans. It is not reassuring to learn that the current administration's leaders, our nation's top law enforcement officials, and military training commands are characterizing law-abiding Americans as dangerous and presumably in need of some kind of re-indoctrination. Those of us who exercise various traditional rights of expression and political choice, who are knowledgeable and appreciative of the US Constitution and the Bill of Rights, or are religious adherents who believe in God, and even military veterans who have been willing to sacrifice themselves for this country--all have been openly painted as being potentially dangerous extremists. Clearly, the Second Amendment to the Constitution, which protects our right to keep and bear arms has held back a radical wave of power-hungry bureaucrats at this point. It certainly has not been the judiciary that has been an obstacle. Watch this very carefully. There is a growing, vocal mass of Americans who are at least making noises like they will not put up with much more. I have to think there is "explosive" potential here for violent acts, IF righteous cause for collective outrage surfaces. 5. War - None of the above really compares to this last category of catastrophic oppression. That is, a military attack on the United States by a well-equipped enemy. Technologies and weapon systems of immense power and impact are proliferating through the world. In years gone by, America held a position of superior strength. We maintained an unpopular position among many as we took on the responsibility of global cop when no one else was willing or able to step in to keep regional differences or difficulties from becoming a conflagration. Today, a new America has apparently relinquished that role. Sure, we're trying to mop up (or who knows what is really going on) in Afghanistan. But obviously there is now a void in the world in that regard and we are in fact embracing those who aim to destroy us. Our shields are being lowered as a show of misguided trust and friendship. Or perhaps even as a willful surrender to other political entities. Will new or traditional enemies move in to take advantage? Will foreign militaries come in unopposed and violently disarm America, occupy us, and neutralize us as a force for justice and fair opportunity? I for one, believe that this could easily be our fate, and it may be at our doorstep sooner than later. If it happens, we cannot expect any kind of mercy at the hands of our conquerors. It will be a nightmare that no one will awaken from. Toxic violence in our streets is already a given. It's real. It's ugly. It's tragic. But it can and probably will get worse. Chances are strong that near-term or within the next few years, at least some of us are going to have to deal with some very different circumstances in life. Think it through now. It's change you better believe in. Labels: Crystal ball, Cultural realities, Political realities, War, Why prepare? Important Read: "Boomers-Winter is Coming"
The article linked below provides an excellent perspective on where we are presently in ongoing, historical global cycles. This commentary by James Quinn leans heavily on Strauss & Howe's "Fourth Turning," while framing it in the timely context of today's headlines. Mr. Quinn is a senior director of strategic planning for a major university. Busy times here at Safecastle world headquarters. New products, a new website in the works, and of course a continuing upward demand trend for preparedness products of all kinds are keeping me hopping. You don't need me to point out that world "leaders" seem to be content flushing their citizens all down into the tank, while they nobly endeavor to remedy the situation for a select chosen few. Times are not going to be getting better, folks. The best advice being offered out there these days is to get your loved ones and households situated for some needy years ahead. I'm not disposed to scare-mongering and indeed am an optimistic sort generally. But I have not found anyone anywhere of late singing "Don't Worry, Be Happy." Have you? We're doing our best to give our members and friends the best offerings we can swing. Our biggest challenge today is with suppliers who are often out of stock of certain items--often for lengthy times. The biggest reasons? ... supply lines, international manufacture and transport difficulties--the general domino effect that takes place when the global economy is claiming victims everywhere on a daily basis. So we continue to adjust for those hiccups as they occur. The good news is that our biggest selling products and primary products line suppliers are continuing to deliver in reliable fashion. If and when we become aware of supply issues with a given product, we remove them from our site immediately. All that said, we ARE very excited about some new developments around here. New products already listed and also others in the pipeline, as well as a much-improved buyers club website that should be launched in the mid-August timeframe are what I'm here to tell you about today. 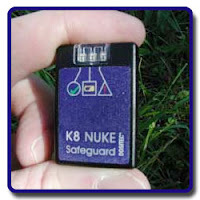 The miniature K8 NUKE Safeguard ratemeter. The new, largest model of the "Bury 'Em" Tube line, the Model 8L. The Inovel 1517 N95 respirator/mask - 20 masks per box. Several Columbia River and SOG knives. Two new Yoders meat listings ... a 12-can variety pack and a 6-can meat sampler pack. A brand new Safecastle "Quest Mission Rig" -- a quality, pre-assembled resource bag that you'll want to have with you most anywhere you go, especially in times of crisis. A line of bicycle cargo trailers that, down the road, just may prove to be one the better small investments in our future any of us make today. In fact, when we are able to make those available, we plan to put together a little sale, offering package deals for those trailers and our ever-popular Montague folding bikes. We are going to have to raise our membership fee a bit when we launch the new website. Of course that does not affect any current members since the one-time fee members paid was/is good for a lifetime. But new members will need to pay a bit more for their memberships. If you know anyone who might want to join, give them a heads-up that now is the time. Sage economist Nouriel Roubini has been one of very few economists on the planet in front of the global economic crisis for the last couple of years. Heed his warnings or suffer the consequences.